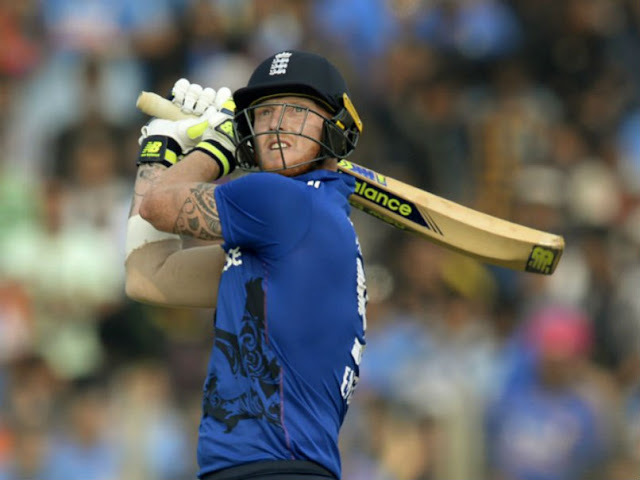 Stokes and Mills got Jackpot , Ben Stokes Set League Record as Highest-Paid Foreign Player. Ben Stokes become most expansive overseas player in IPL. Key Players Retained : Rohit Sharma (C) , Jos Butler , Lendl Simmons , Kieron Pollard , Lashith Malinga , Tim Southee , Harabhajan Singh , Mitchell McClenaghan. Key Players Retained : Suresh Raina , Aaron Finch , Brendon McCullum , James Faulkner , Ravindra Jadeja , Dwayne Bravo , Praveen Kumar. Key Players Retained : Virat Kohli , Chris Gayle , Ab de Villiers , KL Rahul , Shane Watson , Stuart Binny , Yuzvendra Chahal , Sreenath Arveend. Key Players Retained : Gautam gambhir , Robin Uthappa , Manish Pandey , Surya Yadav , Chris Lynn , Sheldon Jackson , Shakib-Al-Hasan , Yusuf Pathan , Piyush Chawla , Umesh Yadav , Sunil Narine. Key Players Retained : MS Dhoni , Ajinkya Rahane , Fuf Du Plessis , Steven Smith , Mitchell Marsh , R. Ashwin , Adam Zampa , Ashoke Dinda. Key Players Retained : Shikhar Dhavan , David Worner , Yuvaraj Singh , Kane Williamson , Moises Henriques , Ben Cutting , Bhuvneshwar Kumar , Mustafizur Rahman. Key Players Retained : David Miller , Shaun Marsh , Hashim Amla , Wriddhiman Saha , Murali Vijay , Glenn Maxwell , Axar Patel , Gurkeerat Mann , Sandeep Sharma , Shardul Thakur , Anureet Singh. 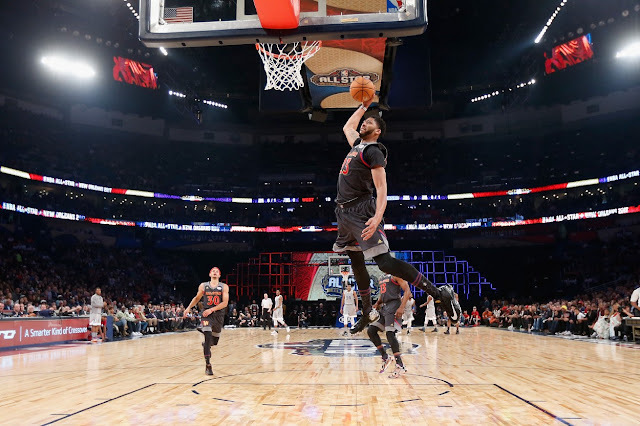 Anthony Davis now hold a record for most points in all star game with 52 points. Davis took an All-Star record 39 shots and scored 52 points to lead the West over the East at the 66th All-Star Game, 192-182 -- the highest-scoring game in league history. The 374 points scored between the teams are the most in NBA All-Star Game history, according to ESPN Stats & Information, surpassing the previous high of 369 set last season. Davis also had 10 rebounds. He held off a late MVP charge by Thunder guard Russell Westbrook, who had 41 points, 7 assists and 5 rebounds. When Russell Westbrook passed to Kevin Durant and the latter lobbed it back to the former for a dunk, NBA narratives shifted like time-lapsed tectonic plates. After totalling 82 seconds together, both were nonchalant, which is an improvement over dismissive. Russ called it a “nice give-and-go.” Durant said the “great basketball play” happened because Westbrook “was open, so I threw him the lob.” It’s a start, but also, hopefully, an end. Before the second half, Westbrook warmed up on KD’s side of the court. Giannis Antetokounmpo paced the East with 30 points. LeBron James finished with 23 points and Isaiah Thomas had 20. In a First quarter Anthony Davis of the West and Giannis Antetokounmpo of the East each pour in 10 points in the first 12 minutes . The East shoots 62.9 percent (22 of 35) to 55 percent (22 of 40) from the West . There was a combined 58 fast break points from the two sides in the first quarter. In a second quarter Anthony Davis leads the way with a game-high 22 points .LeBron James has a team-high 20 points for the East. He's the first player to surpass 300 points in All-Star games. Russell Westbrook has 19. In a 3rd quarter Anthony Davis remains the game's high scorer with 32 points, as well as seven rebounds .Giannis Antetokounmpo leads the East with 28 points .LeBron James has 23 points . both squads shooting near 60 percent in this defense-first affair . Biggest lead has been eight points on both sides . Through three quarters, the West has 92 points in the paint, while the East has 86 .There has been a combined 158 fast break points. In a 4th quarter West outscored East only by 5 points.This was a great game.Westbrook scored 12 points -- all on 3s -- in a 63-second span late in the third quarter after coming off the bench. Then he opened the fourth quarter with another 3, giving him 34 points in just under 14 minutes played to that point. "I was just having fun," Antetokounmpo said. "I told the coaches I'm going to play hard, no matter what. The guys talked to me a lot and they said, 'Your first shot has to be a layup so you can get in a rhythm.' So that's what I did." Antetokounmpo was impressive with 14-of-17 shooting on layups and dunks. He attempted a single three-pointer and missed it. 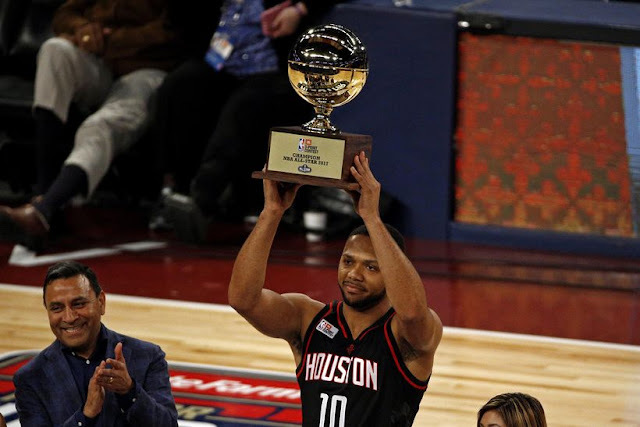 He scored in the last second to reach the 30-point mark, the most scored by a Bucks player in an NBA All-Star Game. He also had six rebounds, three steals and one assist while playing 23 minutes. Gordon had the best round of the whole exhibition to start off his night, with 25 points. He made it to the finals against Kyrie Irving and Kemba Walker and kinda sorta choked on his final rack. Kyrie had set the pace at 20, and Gordon had 19 before getting to the far corner. He hit just one of the five shots there, and a tiebreaker was required. Irving had to go first, and his legs were clearly not the same. He missed several of his shots badly, and didn't even crack 20 points. The man formerly known as E.J. cruised to a score of 21, and took the trophy. Robinson gets the C+, with the plus coming as a result of his victory, which largely happened by default. Robinson’s first dunk was arguably the dunk of the night—he threw down a reverse after grabbing the ball from someone who was perched on someone else’s shoulders. The best part of the slam was Robinson milking the setup, continuously asking the person holding the ball to go higher until he reached his perch. 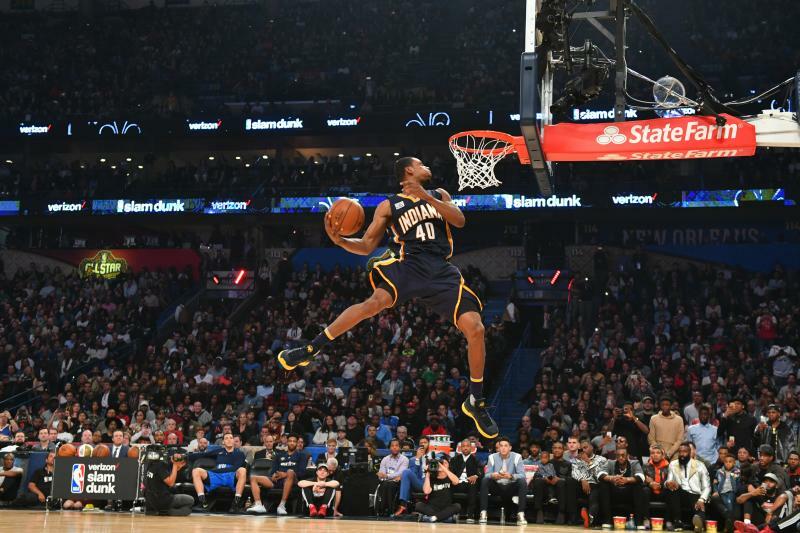 Aoron Gordon failed to defend his Slam Dunk Champion Title. 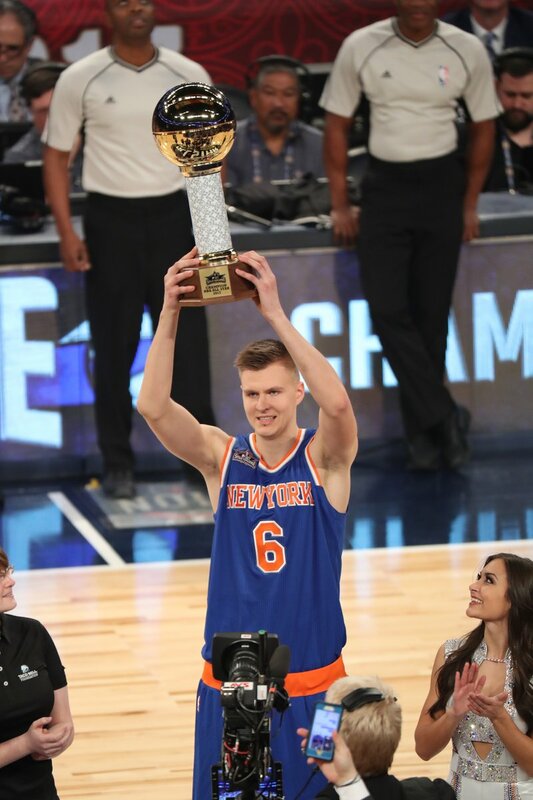 Kristaps Porzingis won skill chalange in All-Star week end. 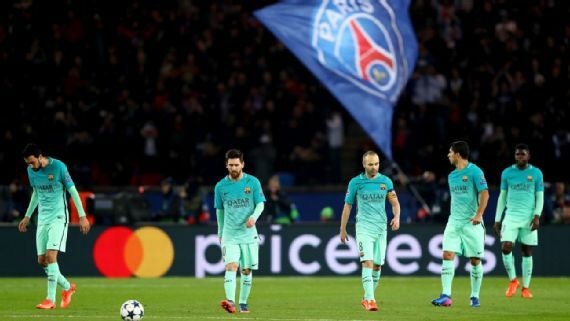 Barcelona Players after defeat against PSG in Uefa Champions League game. Barcelona suffered a heavy defeat at PSG. While Bayern Munich crushed Arsenal 5-1. Now Barcelona have 1% chance for qualifying in next round. Angel Di Maria scored twice along with Julian Draxler and Edinson Cavani in Parc des Princes. Arsenal will face another round of 16 exit in Champions League. Bayern Munich hammered Arsenal 5-1. Arsenal forward Alexis Sanchez is planning to quit the club during the summer after a dressing-room row following the Gunners' heavy Champions League defeat against Bayern Munich. Sutton United boss Paul Doswell says Arsenal’s defeat to Bayern Munich was not a disgrace, insisting none of the Premier League’s top six can compete with the German giants , Barcelona and Real Madrid. Real Madrid came from behind and win a game. Lorenzo Insigne scored on 8th minute and took a lead for Napoli , Karima Benzema scored equaliser for Real Madrid on 18th minute. Toni Croos gave lead to Real Madrid by scoring second goal on 49th minute , After 5 minutes Casemiro scored a last goal of a game. Kevin Love is out for 6 weeks due to knee surgery. This is a bad news for Cavs. LeBron and Kyrie lead Cavs to get a win against Minnesota Timberwolves. They both scored 25 points each. LeBron James scored points against Timberwolves with an average of 26.8 ppg. Andrew Wiggins scored 41 points in a game. He kept his team alive in a game single Handily. 8:34 remaining in 1st quarter , Towns made straight drive to rim and hammered a rim with a dunk. 7:35 remaining in a 1st quarter , Towns made 2 points , Timberwolves got 9 points lead. 4:45 remaining in 1st quarter , Frye three pointer levelled a game for Cavs. In a next position Triston Thompson scored with a dunk on ally oop pass by Kyrie Irving. 2:49 remaining Kyrie Irving shot was blocked by Towns.2:42 Andrew Wiggins Three points gave 3 points lead to Timberwolves in 1st quarter. Minnesota took 4 points lead in 1st quarter. 9:48 remaining in a second quarter , Kyle Korver levelled a game for Cavs by scoring three pointer assisted by James. 3:58 remaining in 2nd quarter , kyrie Irving made 3-pointer , Cavs got 7 points lead. 44 seconds remaining in 1st half , James drives and hammered a rims with a powerful dunk. Channing Frye made last seconds 3-pointer assisted by LeBron James. Cavs took 8 points lead after first half. Cavs made 8-0 run in 2 minutes ,6:11 remaining in 3rd quarter , Kyrie Irving made 3-pointer , assisted by LeBron James. Wiggins scored 19 points in a 3rd quarter. Minnesota Timberwolves outrun Cavs with 15-5 and levelled a game in third quarter 93-93. Wiggings made a two pointer at a buzzer Turnover by LeBron James. Andrew wiggins made 2 points and cut a lead to 1 point. 5:22 remaining in a last quarter LeBron James ally oop pass to Derrick Williams , Derrick Williams made a Dunk. 2:06 remaining in 4th quarter , LeBron James made 3 pointer , Cavs got 6 points lead. 1:41 remaining Derrick Williams steals a ball and scored 2 points , 8 points lead for Cavs. Cavs outscored Minnesota in Last quarter of a game with 23-15. Now Cavs will Face Indiana Pacers tomorrow and Minnesota Timberwolves will face Nuggets. Kyrie Irving and Lebron James scored 27 points in a game , Lebron James scored 20+ points in 17 consecutive games against Denver Nuggets. Nuggets missing key players Kenneth Faried, Danilo Gallinari and Emmanuel Mudiay with injuries. After four games road trip Cavs are back in Home Court. They dominated Nuggets in a game. James also finished with 12 assists and passed Brad Daugherty (5,227) for the second-most rebounds in team history. Iman Shumpert missed his 3rd straight game due to a sprained left ankle. In a first quarter ,Nuggets made 11-5 run in three minutes and took a lead of 5 points. 10:18 remaining in 2nd quarter , A great spinning move by LeBron James , He made a two points and draw a foul. 9:05 LeBron James made a layup shot which gave a 2 points lead to Cavs. James set Williams up for a wide-open 3-pointer that he drained with 5:05 left in the second, and on the next possession Irving flipped it to Williams on a fast break for a nice dunk, much to the delight of Williams and the crowd.4:11 remaining in 2nd quarter Kyle Kover's 3-points gave 6 points lead to Cavs. Cavs outscored Nuggets 31-22 in 2nd quarter and took 4 points lead after first half. Cavs started a third quarter with Kyrie Irving's 3-pointers. 9:20 Remaining in 3rd quarter , Wiggins made a running layup shot , assisted by Love , Cavs got 11 points lead. 7:01 remaining in 3rd quarter , In 4:18 minutes Cavs made 18-0 run and took a lead of 22 points. Cavs took 14 points lead after 3rd quarter. Both Teams were on same level in fourth quarter but Nuggets was unable to give any threats to Cavs in a game after first half. When the Cavs lost to the Thunder, they were playing for the third time in four nights, fourth in six, were missing three shooting guards, and the Thunder hadn't played since Monday. Now Cavs will play Minnesota Timberwolves while Denver Nuggets will play Mighty team Golden State Warriors. Cavs wrap up 4game Road trip at 3-1.Derrick Williams scored 12 points in a game in a debut game for Cavs. 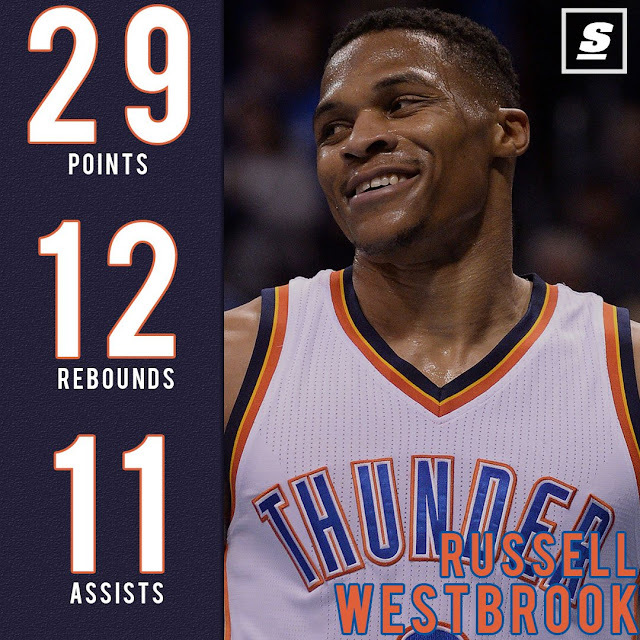 Russell Westbrook scored 26th triple-double of a season and levelled for most triple-double in single Season with O.Robertson for 4th place. Cavs sign former no.2 overall pick Derrick Williams to 10-day contract. 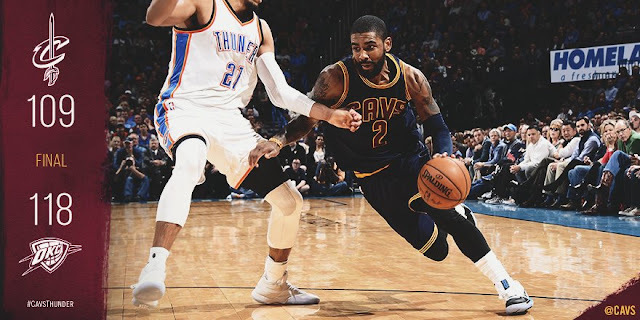 OKC out rebounded Cavs in this game with 51 to 35 , Which helped them to get a win over NBA Champion Cavs. Big game for Cameron Payne tonight. In a win over the Cavs he scored a season-high 15 on 6-of-12 shooting. 6:45 remaining in 1st quarter , Russell Westbrook put on a free throw line where he scored both free throws. OKC got 6 points lead. 4:15 remaining in a 1st quarter Kyrie Irving made 3-point shot which cut a lead to 1 points. 3:14 minutes remaining in 1st quarter , Kevin Love made layup shot assisted by Irving which gave 1 points lead to Cavs. and Love mad a free throw ,Cavs got 2 points lead but Adams cutting dunk levelled a game for OKC. After this Cavs missed all their shots which helped OKC to take a lead in a quarter with lead of 8 points. OKC started second quarter strongly. But Cavs made 12-0 run in just 3 minutes and levelled a game with OKC. Russell Westbrook made 3 point shot assisted by Adams 3 points lead for OKC. OKC held a lead until 1:02 minutes remaining in a 2nd quarter where Kyrie Irving layup shot levelled a game. Love made a layup shot assisted by Irving which gave 2 points lead to Cavs. Cavs got 2 points lead after first half. 26th triple-double for Russell Westbrook in this season. 8:14 minutes remaining in 3rd quarter , Lebron missed an easy dunk on Kyrie Irving pass. 5:55 minutes left in a quarter , Kyrie scored 3-points. Cavs 67 -OKC 67. 4:40 remaining , Westbrook got a step and a bucket and drew a foul on Kyrie Irving , 3 points play for Russell Westbrook and 5 points lead for OKC. OKC took 4 points lead after 3rd quarter. In a 4th quarter , Lebron James not able to score a single point. He was able to hit only 2 shots in fourth quarter. 2:08 remaining in 4th quarter , Oladipo stole a ball , He passed a ball to Westbrook , Westbrook gave it back to Oladipo , Oladipo scored 2 point with 360 degree layup. Russell Westbrook registered his 26 Triple-Double of a season. OKC won a game by 9 points. Now OKC will Face Kevin Durant's Team GSW which is in first place in NBA. 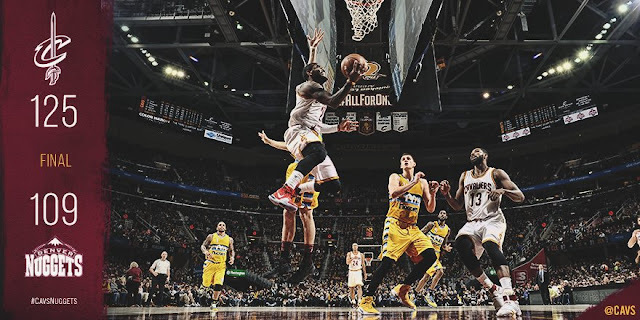 Cavs will face Denver Nuggets. Cavs ends Indiana Pacers 7 games winning streak , Lebron James registered his 800th block of his career in this game. 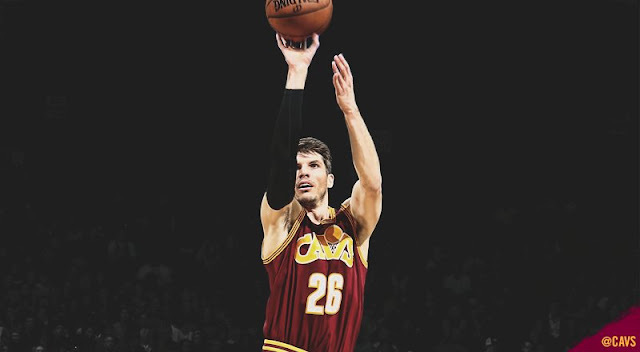 This was Kyle Korver's best night as Cleveland Cavaliers' player , He scored 29 points and shot 10-of-12 overall and 8-of-9 from 3-point range. The Cavs played without starting shooting guard Iman Shumpert who missed a game due to sprained left ankle , who will also miss Thursday night's game in Oklahoma City that will end Cleveland's four-game road trip. DeAndre Liggins played in a position of Iman Shumpert. 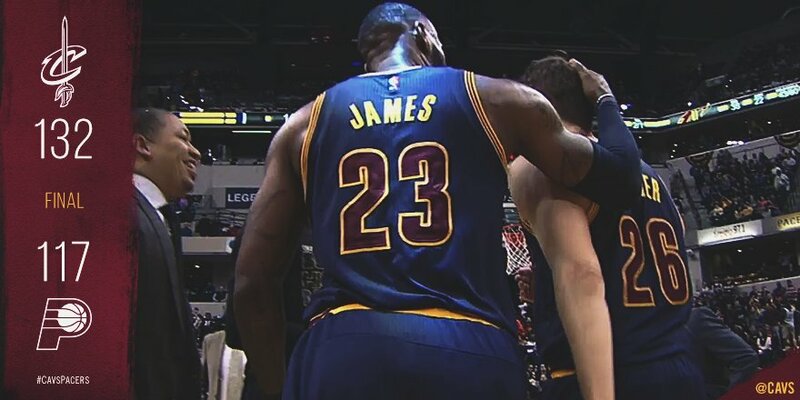 LeBron James didn't played his last 2 games against Pacers where Cavs lost both of their games. 9:23 minutes remaining in 1st quarter , Miles 3-pointer gave 6 points lead to Indiana Pacers. but Liggings 3-pointer from a corner gave 2 points lead to Cavs. 4:13 remaining in 1st quarter Pacers made 14-2 run and took 10 points lead. In a First Quarter Indiana Pacers took 11 points lead. 5:31 remaining in 2nd quarter , Irving's Jumper cut a lead to single digit. 4:58 minutes left in a quarter McRae hits a 3-pointer as a lead cut to 5 points. 34.6 second left in 2nd quarter , LeBron James shot blocked by Turner. After the end of a first half Indiana Pacers took a lead of 6 points. Kyle Korver passed Jason Kidd For 7th all time 3 points FGM in NBA history. Four straight games with 15+ treys from deep ,1st time In Cavs History. 11:50 minutes remaining in 3rd quarter , Irving made an ally-oop pass to LeBron James , LeBron Scored 2-pointer on Ally-oop. Cavs cut a lead to 4 points. Allen made a bad pass , DeAndre Liggind steals a ball and scored 2 points. 9:37 remaining in 3rd quarter , Paul George layup was blocked by James , Now James made 800 blocks in his career. Kevin Love's 2 points play levelled a game for Cavs. 8:43 minutes left in 3rd quarter ,A basket by Kyrie Irving and he was tripped by Teague which put Kyrie on free-throw line. Cavs got 3 points lead in a game. Cavs made 17-6 run in 5 minutes in 3rd quarter which put Indiana Pacers out of a game. Cavs took 11 points lead in a game. the third period is when this game changed. Trailing by six at halftime, the Cavs demolished the Pacers 40-18 in the third and led 97-81 when it was over. Both teams were nearly matched in 4th quarter. Match went into a favour of Cavaliers. Cavaliers end Indiana Pacers 7 games winning streak. They also ended winning run of Washington Wizards where Wizards won their last 7 games until they lost to Cavs. 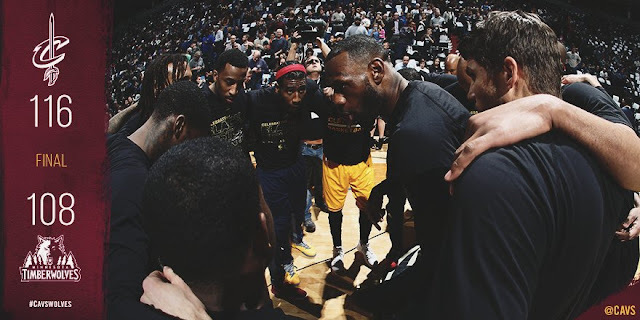 Coach Tyronn Lue speculated Wednesday morning that a heavy workload for James against the Pacers may force him to the sidelines against the Thunder. Cricket : IPL Auction 2017 : Ben Stokes gets 14.50cr in IPL Auction. NBA : Starting Lineup For NBA All-Star 2017 Game.